Girls, she has the CUTEST stuff, I got us little drawstring Nash Bash Gift Bags too. 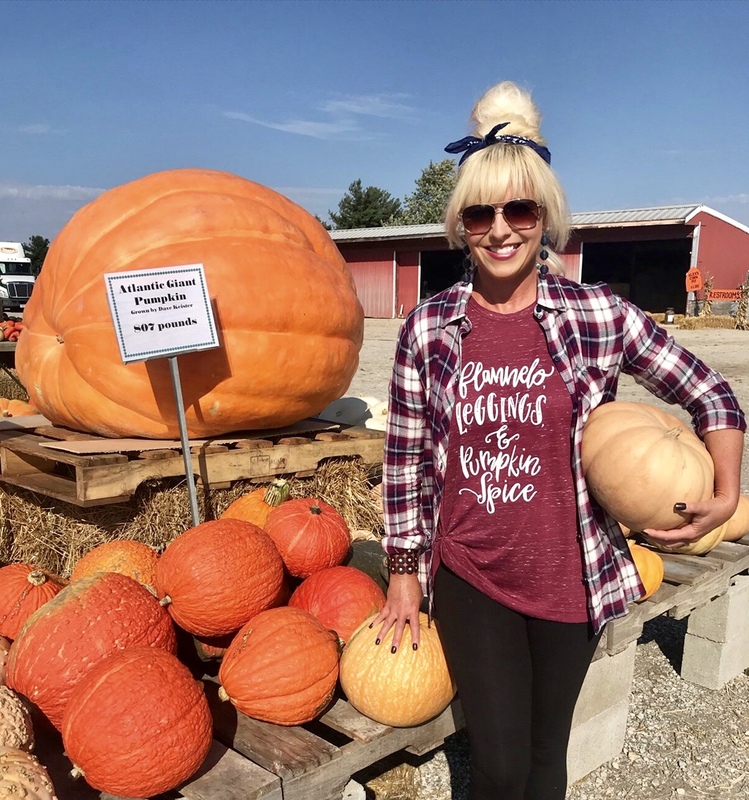 I needed a few more phots and really wanted to do the whole flannel and leggings with it, so on a HOT 85 degree day last week, we headed to a local Pumpkin patch for a few shoots. Believe me the flannel got thrown off quickly and our temps this week are so crisp Fall 50's Fabulous! taken by the ever talented Shelly! These tees are soooooo soft!! And more CUTE sayings than you can imagine! And the color options are endless! 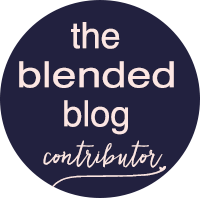 Head over to The Blended Blog to see what darling Graphic our Vanessa is wearing! And Make sure to hop around as each of my friends in this photo are styling this very tee today as well! You all look so cute. I love the pumpkin farm. Great location photos and looks such fun. I'm headed over to that Etsy shop to stock up on fall and Christmas tshirts. That was such a fun idea to get everyone shirts for the trip! You are the cutest! 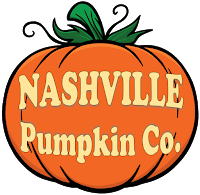 I love your local pumpkin patch, great idea to get photos there. I love my tee and just might pop it on today in hopes that someday soon the weather will cooperate! It's so nice to see our picture from the trip, what great memories! I love how everyone styled that shirt in their own way! The camo pants paired with it are really cute and I wouldn't have thought to do that! 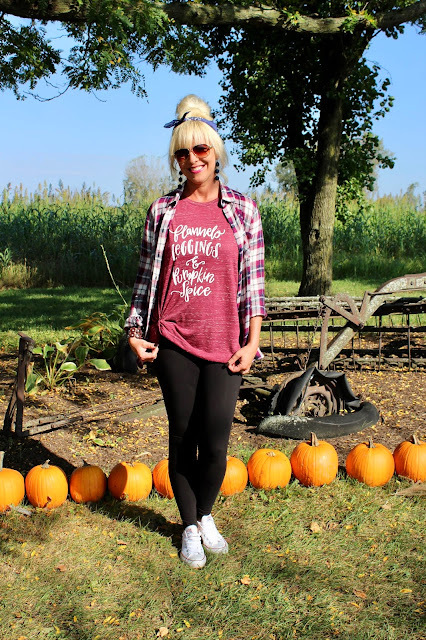 The shirts are darling and it is cute as can be with that flannel! It is definitely flannel weather now and crazy how fast it turned! I might have to steal that give them pumpkin to talk about saying... too cute! What a great idea to buy shirts for your gang in Nashville. I love it!! You're so thoughtful and generous, which I knew already!! Have a great day!! How many times am I permitted to say "cute" in a comment? Just imagine that times 100. You give the best shout outs for companies, friends and whatever else you come across. Love you and your giving spirit and think you're just too CUTE! You six spicy pumpkins are mega adorable. Love your super cute first photo and Shelly takes a mean pumpkin portrait too. But pair YOU with a pumpkin in autumn and a pineapple in summer and you rule the Cute Kingdom! Hugs, x. That flannel and that pumpkin spice top go together perfectly! You all look fabulous at the pumpkin patch all together! Glad you had such a great trip! I LOVE my shirt and have already worn it twice since coming home! You did good! How stinkin cute you girls are! I’m heading to that Etsy shop to take a peek around. I love that you all got matching tees...that's super fun Andrea!! Boy, do I know how those temps were not cooperating with all of the Fall fabulous looks! 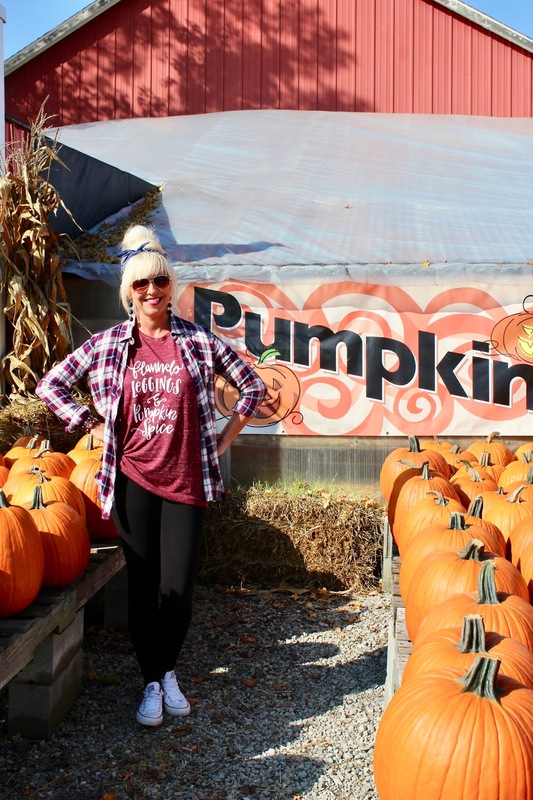 Such great pumpkin patch photos and I love your tees! How sweet are you to provide all of your friends with these t-shirts for this fun activity and photo op! Love the color of the tee and all of the fab accessories your paired with yours. Those are great bracelets on both wrists! Could you be anymore prettier?? And I love love outfit!! You have such great style, you always knock it out of the park!! I wish I was a stylish as you. You ladies all look so cute. I told Laura that I love graphic tees paired with flannel tops this time of year. So adorable. Totally loving the fall vibes!! And how cute are those tees!! I love the cute-tee and the t-shirt too! hehe. So fun and perfect with the flannel so ready for Fall. Love that you got all of the ladies tees! 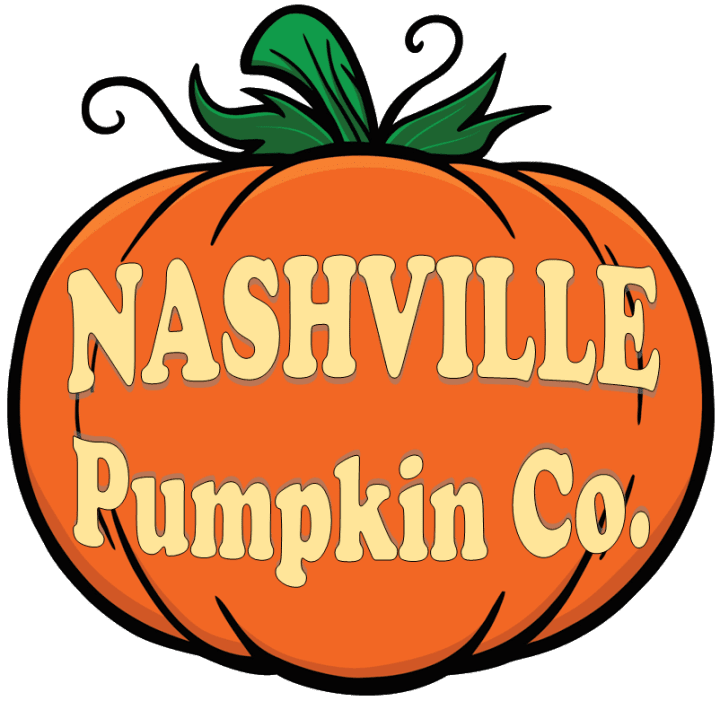 The pumpkin patch looks fun. Y'all are so cute and I love these tees! I finally ordered a fall tee on Amazon today and I can't wait for it to come in! They all 3 worked for me. Etsy just redirects after 10 seconds when you click the link. ;-) It notes right on there re-directing. Hope this helps! That shirt is beyond adorable! 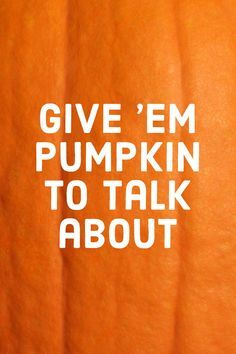 And so perfect for the season! 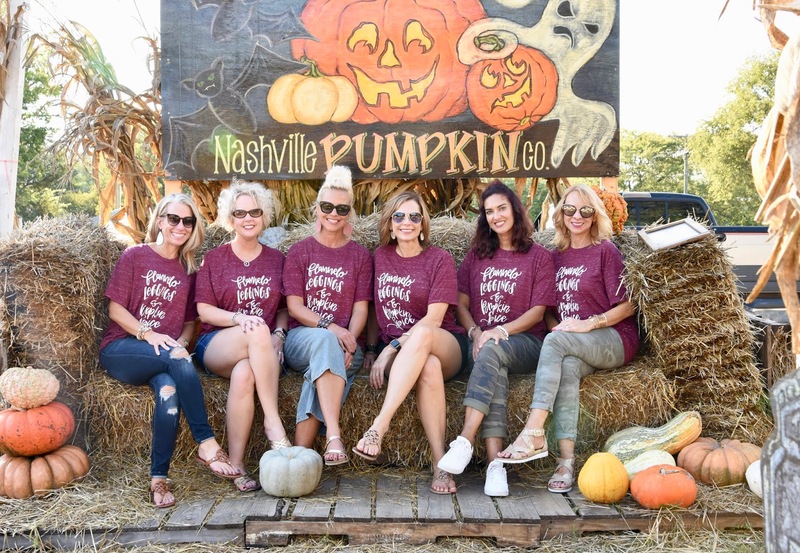 I love that y'all wore the same shirt and went to a pumpkin patch for some pictures! What a great trip! And those tees are perfect! 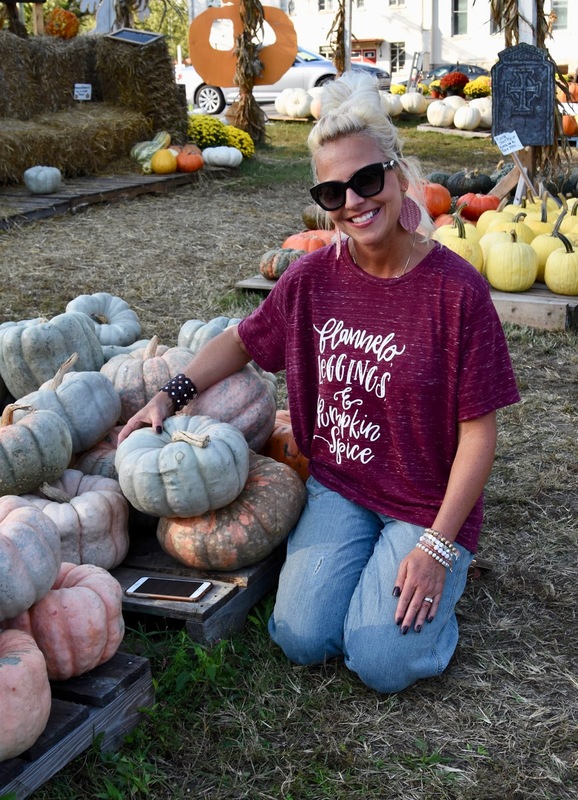 Love the fall vibes and your pumpkin patch shoot! Those shirts are the cutest! You are my favorite punkin, Babe! And darn! I forgot about the picture with the old truck in it! So many memories!! Love that you did this for the group, they are too cute! Our weather down here will not cooperate! I am headed over to browse for a shirt! Love these pics! You look like you are having the time of your life!! Have a great week, dear Andrea. You look so cute as usual Andrea! How nice to all have those T-shirts. It’s definitely sweater weather and I am going to have to put away my summer clothes! That is such a fun tee for this time of year. I love the group photo of you all wearing it!! What a cute photo but everyone you gals took was cute. :o)) Love the tees and may have to sneak over and check the shop out. Have a great rest of the week and I'll "see" ya when we get home from our trip. Seriously... y'all are the CUTEST and I love those tees and the color of them. You styled it so well and I always love your top bun, especially with the bandana! So perfect! That graphic tee is so much fun! I love the relaxed fit! These tees are adorable - and I love the color! Such a cute idea to get matching tees! You made a great call getting large for everyone, the oversized fit is perfect. Pumpkin patch cuties!! 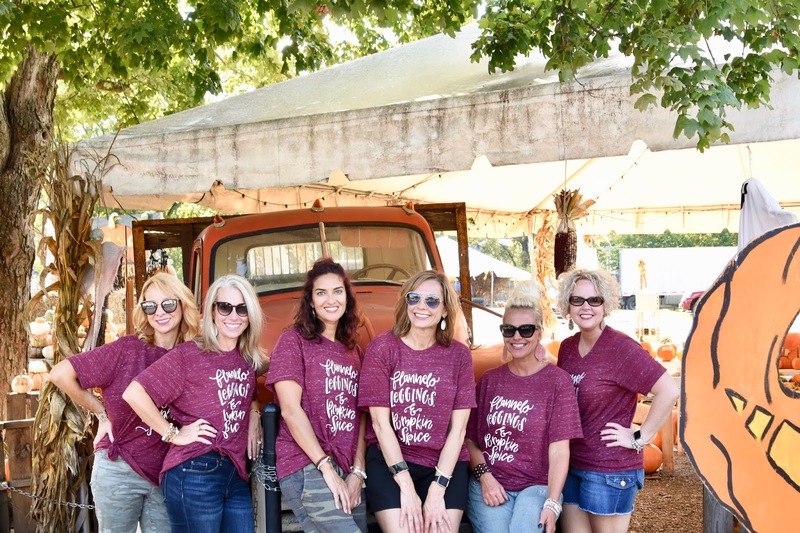 Loving this fall post--it looks like y'all had an absolute blast!! That t-shirt needs to get in my closet! Sometimes I feel bad for people who live where it's super hot- they don't get to really wear all the cozy clothes! Cute top! What a super cute look for a pumpkin patch outing! How FUN, girlfriend! You look so cute & comfy in that outfit! Those are the cutest tees. I love that you all had the same one! You are looking like fall perfection! 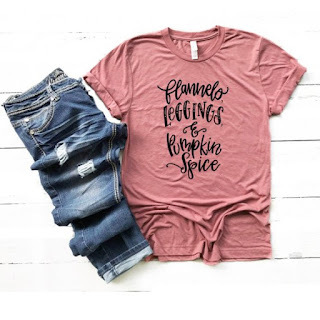 Such a fun little tee! What a cute fall outfit. I love that tee and that color is gorgeous on you. Great pictures! And I love the matching shirts.